What drink would you usually associate with Australian Rock N’ Roll? The answer is beer, as for reasons unknown, this is their preferred drink and they even bring it with them on tour, with one example being, AIRBOURNE, who I remember seeing live last year in August and they bought beer with them. The reason I bring this up is because often some Australian bands will write lyrics about beer drinking. 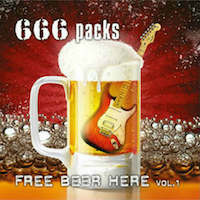 One such band is 666 PACKS who are actually from Greece (Athens to be specific) but they have released an album which pays homage to the beer drinking lyrics of Australian bands with their debut CD “Free Beer Here Vol.1”, which is out now on Rock of Angels Records. The band classify themselves as a Hard Rock Beer band which does make sense when you listen to the lyrics, and also the song titles, plus the album cover are a bit of a dead giveaway. When you listen, you get the impression that they have taken their influence from AC/DC mainly in the vocal department, as the vocals remind be a bit of the band’s current singer Brian Johnson, who granted, yes I have not heard that much of, but I have heard the odd track here and there so I have been able to identify his voice and the singer for 666 PACKS reminds me of that. Speaking of AC/DC, there is a cover of the band’s smash hit “Back In Black”, which closes off this eight track CD with the first seven songs being original material. So what about the way it sounds when you listen to it? As mentioned, the band are all about writing lyrics, which in my opinion, seem to pay homage to those written by bands from Australia and I am definitely picking up that vibe and influence in the music, as for the most part it’s Hard Rock music which is very heavy and also quite energetic too meaning the overall performance of the music is very good. The vocals on this CD seem to be focused on sounding like a beer drinking style voice which I've heard on one album I've reviewed so far (“Free Ride” by CRUIZZEN to be exact) and I give the singer points for being able to pull it off, but I’ll have to deduct a couple for the fact that some of the time I can’t understand the words, as I think the way the voice sounded seemed to be a bigger priority but overall, I found the vocals to be very good despite those relatively small issues. Overall summary of this album is as follows: the music is good as it sounds hard and heavy, the vocals sound good too despite any little issues I may have pointed out, and the band have definitely paid homage to the beer drinking lyrics of Australian bands, but whether or not this was intentional remains to be seen, but that’s the impression I got anyway when listening to it and I enjoyed it for the most part.